Dune is an original soundtrack album for the 1984 film Dune. Most of the album was composed by the popular rock band Toto—their first and only film score—but one track was contributed by Brian Eno. The soundtrack album was first released in November 1984. An extended version with an altered track listing was released in 1997. Both versions are currently out of print on traditional media such as CD but with the increasing popularity of download services have gained improved exposure through such channels as iTunes and Spotify. The instrumental soundtrack was recorded by the band (minus lead singer Fergie Frederiksen), accompanied by the Vienna Symphony Orchestra and the Vienna Volksoper Choir, conducted by Marty Paich, father of Toto keyboardist David Paich. "Prophecy Theme" was composed for the movie by Brian Eno, who is rumored to have composed an entire earlier Dune soundtrack, although only "Prophecy Theme" and some incidental background music survived in the final film version. The first release of the soundtrack contained select cues in their original film order, plus two pieces of dialogue from the movie that served as bookends for two tracks ("Prologue" and "The Floating Fat Man (The Baron)"). This first issue was released by Polydor Records. The album includes an alternative take of the "Main Title", that had not been used in the film. An extended version containing additional cues was released in 1997 on PEG Records, an independent label division of Polygram. On this issue multiple tracks had mastering problems which resulted in audible distortion in the form of a 'wobbling' effect. Furthermore, many cues (particularly in the second half of the expanded CD) were mislabeled and placed out of film order. The album includes the film version of the "Main Title", and an original demo of the main title music. There are several differences between the music on the two soundtrack albums and that heard in the film. For example, the end title theme, "Take My Hand", is heard on the soundtrack CDs minus the orchestration heard in the final film mix. The version of "Robot Fight" on the original soundtrack is heard in the theatrical version, while the version on the expanded CD is only heard in the extended "Allen Smithee" TV version of the film. 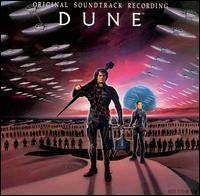 The cues "Riding The Sandworm" (from the expanded CD) and "Dune (Desert Theme)", "Prelude (Take My Hand)", "Paul Kills Feyd" and "Final Dream" (from both soundtrack issues) are not heard in the movie, and are replaced by either repeated or alternate cues. However, the television version does restore "Paul Kills Feyd" in its original place in the movie, and "Dune (Desert Theme)", which was intended as the end title music, is replaced by "Take My Hand." Virginia Madsen - Narration on "Prologue"
Kenneth McMillan and Paul Smith - Dialogue on "The Floating Fat Man (The Baron)"
^ Clemmensen, Christian (6 September 2008) [16 December 1997]. "Dune (Toto)". Filmtracks.com. Retrieved 5 February 2012. ^ Nielsen Business Media, Inc. (November 3, 1984). Billboard. Nielsen Business Media, Inc. p. 54. ^ "Dune (Toto) iTunes Preview". Apple Pty Ltd. Retrieved 2012-01-04. ^ "Dune (Toto)". Filmtracks. Retrieved 2011-10-19. This page was last edited on 18 March 2019, at 17:27 (UTC).